Well, folks – chilly weather is officially here to stay! December is usually still a bit finicky in Texas, offering up an unpredictable mixture of sunny + warm and cold + dreary. We’ve had a few more cold fronts over the past week that have solidified winter is here. With that said, it’s time to break out your heavy knits! 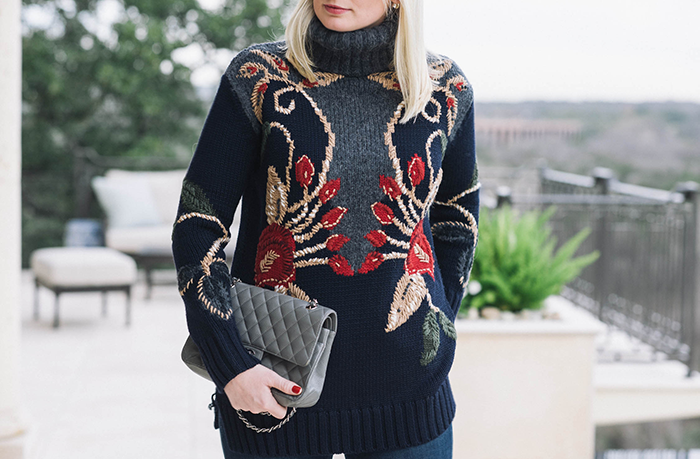 One that’s been both festive and cozy this holiday season has been this Tory Burch sweater from fall. The pops of red throughout the print look swell paired back with my Aquazzura booties (now on sale, by the way)! Even though Resort/Spring ’15 collections have been and will continue to appear on our favorite e-boutiques, now’s the time to stock up on cashmere and cozy knits, because so many are marked down! I always like to pick up a few knit basics this time of year so that I’m ready when the temps drop the following season. 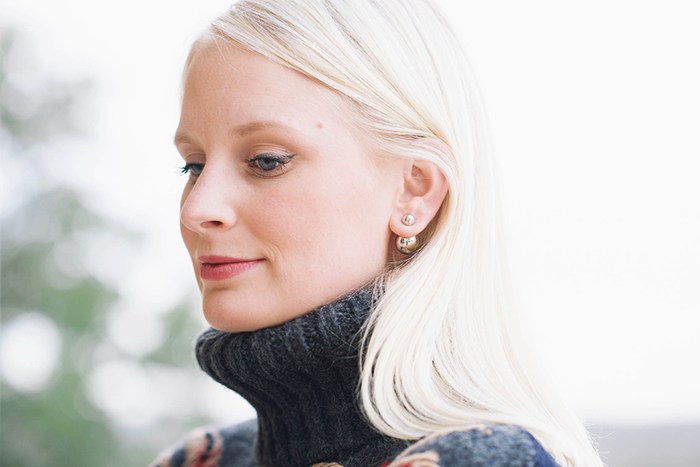 This season these have included this classic Vince turtleneck (so soft! ), this oversized Theory sweater, and this comfy long-sleeved LBD. 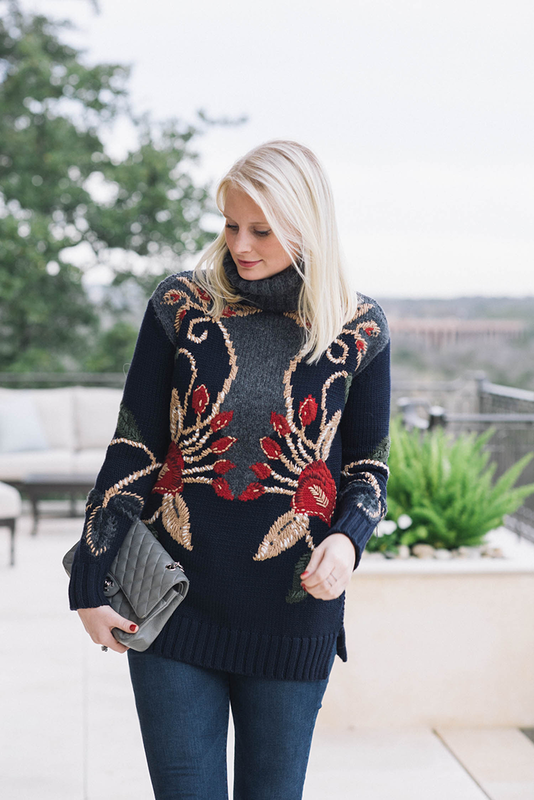 A couple other knits I recommend: this side-zip sweater and this embellished Lela Rose sweater! So many good sale finds. This sweater is everything, great outfit. I love how you dressed up this turtleneck & those shoes, so so good! Don’t know if I can pull that turtleneck off but so cool on you. And of course those shoes are amazing. Gorgeous! I love the heels with it. this sweater is so pretty! and I love the red shoes paired with it, those are amazing! You look very festive and cozy! That sweater is gorgeous!!!! I love the look head to toe! That Chanel bag is too cool! Love these red heels! Happy New Year Merritt! that sweater is amazing!!! Loving the pattern and how it matches your shoes perfectly. I love this outfit! The sweater with the shoes are perfect! I’ve had those Aquazzura’s on my list for a while now! Love them! Maybe in 2015 I’ll snag me a pair. Those shoes!!! Love them in the red, it’s such a beautiful color on you!